•Restlessness or a feeling of being "edgy"
•Genetics: Some research suggests that family history plays a part in increasing the likelihood that a person will develop GAD. This means that the tendency to develop GAD may be passed on in families. •Brain chemistry: GAD has been associated with abnormal levels of certain neurotransmitters in the brain. Neurotransmitters are special chemical messengers that help move information from nerve cell to nerve cell. If the neurotransmitters are out of balance, messages cannot get through the brain properly. This can alter the way the brain reacts in certain situations, leading to anxiety. •Environmental factors: Trauma and stressful events, such as abuse, the death of a loved one, divorce, changing jobs or schools, may lead to GAD. GAD also may become worse during periods of stress. The use of and withdrawal from addictive substances, including alcohol, caffeine, and nicotine, can also worsen anxiety. The doctor bases his or her diagnosis of GAD on reports of the intensity and duration of symptoms -- including any problems with functioning caused by the symptoms. 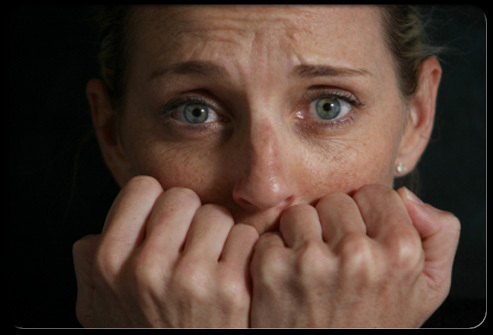 The doctor then determines if the symptoms and degree of dysfunction indicate a specific anxiety disorder. GAD is diagnosed if symptoms are present for more days than not during a period of at least six months. The symptoms also must interfere with daily living, such as causing you to miss work or school. If no physical illness is found, you may be referred to a psychiatrist or psychologist, mental health professionals who are specially trained to diagnose and treat mental illnesses like GAD. Treatment for GAD most often includes a combination of medication and cognitive-behavioral therapy. •Medication: Drugs are available to treat GAD and may be especially helpful for people whose anxiety is interfering with daily functioning. The medications most often used to treat GAD in the short-term are from a class of drugs called benzodiazepines. These medications are sometimes referred to as "tranquilizers," because they leave you feeling calm and relaxed. They work by decreasing the physical symptoms of GAD, such as muscle tension and restlessness. Common benzodiazepines include Xanax, Librium, Valium and Ativan. Antidepressants, such as Paxil, Effexor, Prozac, Lexapro, and Zoloft, are also being used to treat GAD. These antidepressants may take a few weeks to start working but they're more appropriate for long-term treatment of GAD. •Cognitive-behavioral therapy: People suffering from anxiety disorders often participate in this type of therapy, in which you learn to recognize and change thought patterns and behaviors that lead to anxious feelings. This type of therapy helps limit distorted thinking by looking at worries more realistically. In addition, relaxation techniques, such as deep breathing and biofeedback, may help to control the muscle tension that often accompanies GAD. Are There Side Effects of GAD Treatment? Dependency on anti-anxiety medications (benzodiazepines) is a potential complication of treatment. Side effects of antidepressants vary by specific drug and the person taking them. Common side effects can include sleepiness, weight gain, and sexual problems. Although many people with GAD cannot be cured and symptoms can return from time to time, most people gain substantial relief from their symptoms with proper treatment. •Stop or reduce your consumption of products that contain caffeine, such as coffee, tea, cola and chocolate. •Ask your doctor or pharmacist before taking any over-the-counter medicines or herbal remedies. Many contain chemicals that can increase anxiety symptoms. •Exercise daily and eat a healthy, balanced diet. 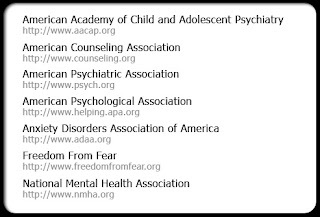 •Seek counseling and support after a traumatic or disturbing experience. •Practice stress management techniques like yoga or meditation. Campbell, S.G., and A.A. Abbass. "Chest Pain -- Consider Panic Disorder." Canadian Family Physician 53.5 May 2007: 807-808. Furukawa, T.A., and N. Watanabe. 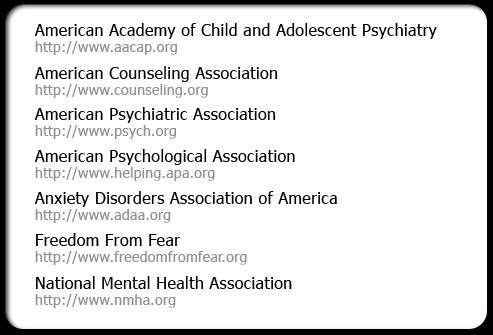 "Psychotherapy Plus Antidepressant for Panic Disorder With or Without Agoraphobia." The British Journal of Psychiatry 188 (2006): 305-312. Ham, P., D.B. Waters, and M.N. Oliver. "Treatment of Panic Disorder." American Family Physician 71.4 Feb. 15, 2005. Katon, W.J. "Panic Disorder." The New England Journal of Medicine 354 June 2006: 2360-2367. Kessler, R.C., W. Tat-Chiu, R. Jin, A. Meron-Ruscio, et al. 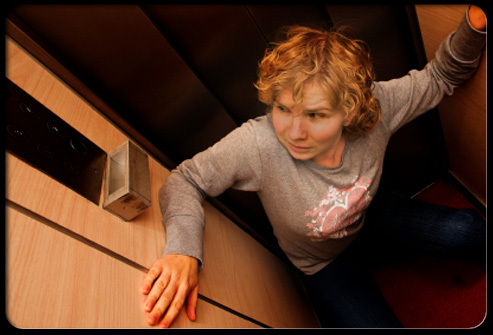 "The Epidemiology of Panic Attacks, Panic Disorder and Agoraphobia in the National Comorbidity Survey Replication." Archives of General Psychiatry 63 (2006): 415-424..
Saeed, S.A., R.M. Bloch, and D.J. Antonacci. 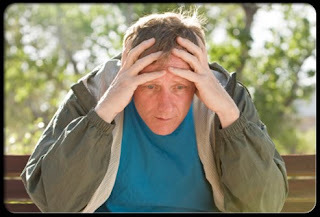 "Herbal and Dietary Supplements for Treatment of Anxiety Disorders." American Family Physician 76 Aug. 2007:549-556. Safren, S.A., B.S. Gershuny, P. Marzol, M. Otto, and M.H. Pollack. "History of Childhood Abuse in Panic Disorder, Social Phobia and Generalized Anxiety Disorder." The Journal of Nervous and Mental Disease 190.7 July 2002: 453-456. Zvolensky, M.J., and N.B. Schmidt. "Introduction to Anxiety Sensitivity." Behavior Modification 31.2 (2007): 139-144.